Yesterday (April 17, 2017) European pine sawfly, Neodiprion sertifer larvae were detected feeding on my “indicator pine” in Manhattan, KS (I was totally excited!). 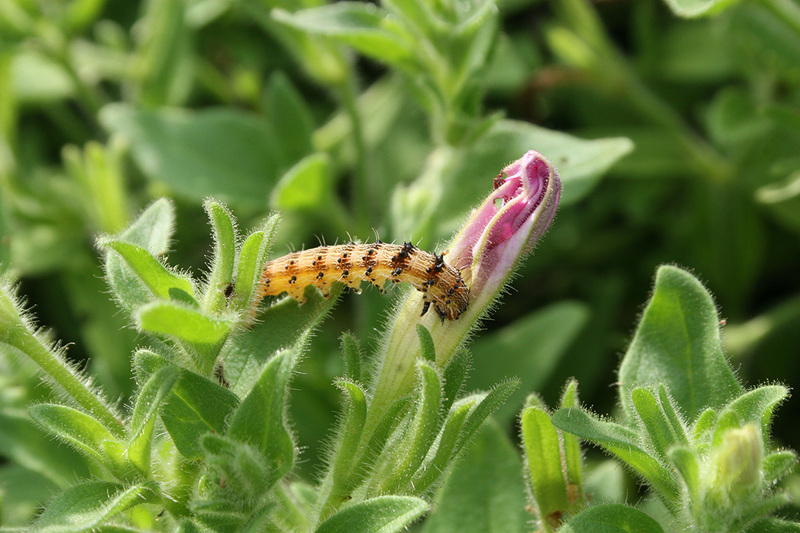 Young caterpillar-looking larvae are 1/4 inch in length and olive-green in color with a black head (Figures 1). 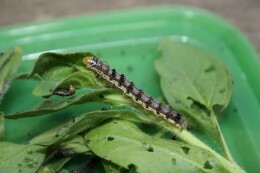 Mature larvae are >1.0 inch long with green stripes. 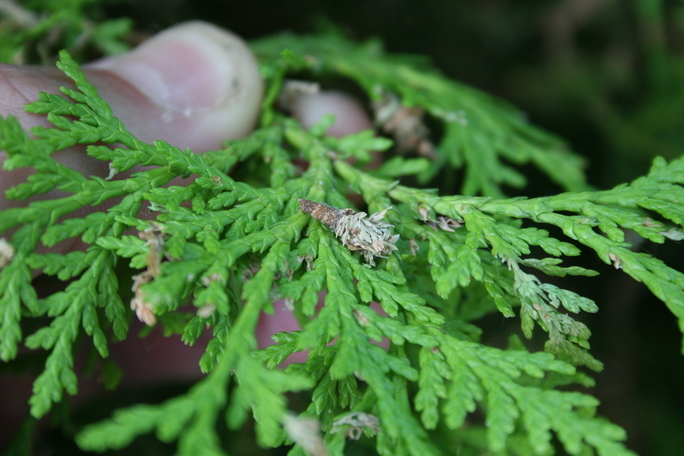 The larvae are gregarious or feed in groups on needles of a variety of pines, especially Scotch, red, and mugo pine. When disturbed, each individual larva will arch their head and abdomen (last segment of an insect body) back, forming a “C-shape” (Figure 2), which is a defensive posture to ward-off predators. 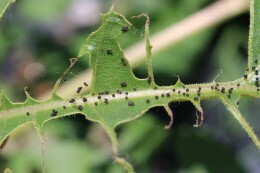 Eventually, larvae will strip the needles of mature foliage, leaving only the central core, which is white and then turns brown (Figure 3). In general, larvae complete feeding by the time needles emerge from the candelabra. Therefore, those really is only a minor threat of branch or tree death resulting from sawfly larval feeding. However, the loss of second- and third-year needles will be noticeable in landscape trees; thus ruining their aesthetic appearance. 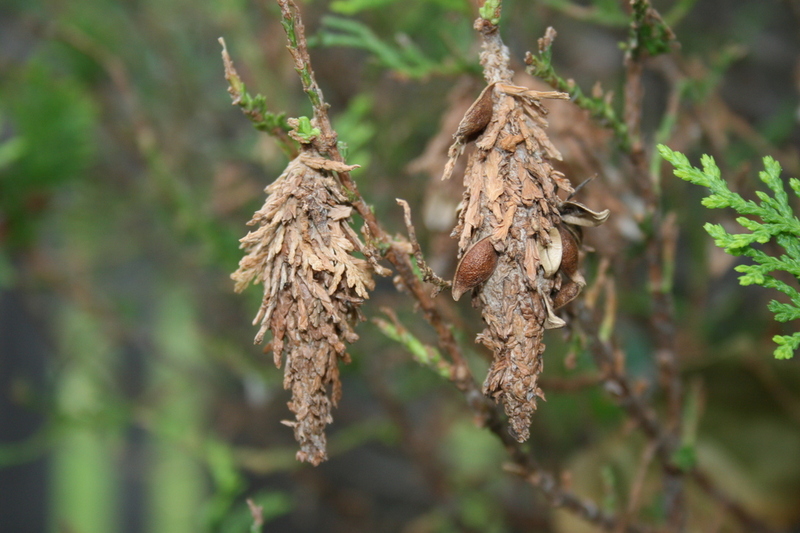 In late spring, larvae drop to the ground and pupate in brown, leathery cocoons located at the base of trees. Adults, which are wasp-like, emerge in fall and lay eggs in needles prior to the onset of winter. There is one generation per year in Kansas. 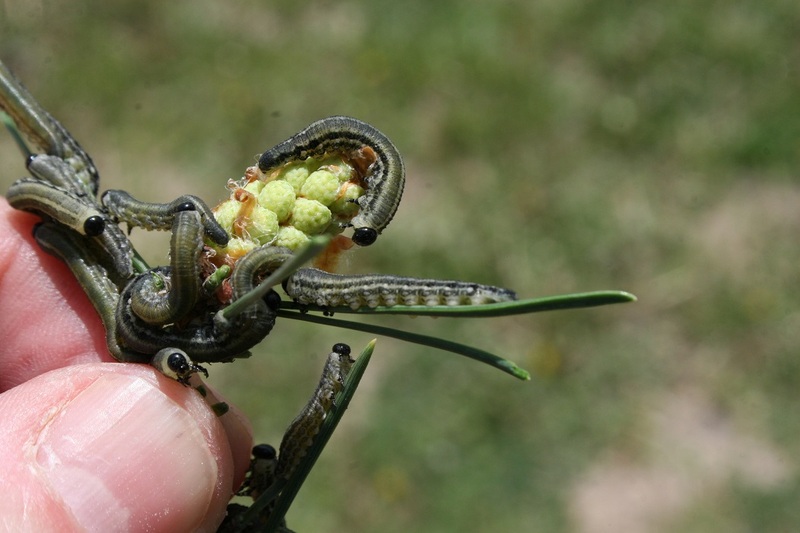 Sawfly larvae look-like caterpillars; but, they are not caterpillars (Order: Lepidoptera). Sawflies are related to ants, bees, and wasps (Order: Hymenoptera). The primary way to distinguish a sawfly larva from a caterpillar is by the following: 1) sawfly larva have prolegs (fleshy abdominal legs) on every abdominal segment whereas caterpillars are missing prolegs on the abdomen and 2) caterpillar larva have hairs or crochets on their feet whereas sawfly larva do not have hairs or crochets on their feet. Sawfly larvae are not caterpillars, therefore, the bacterial insecticide, Bacillus thuringiensis subsp. kurstaki (sold as Dipel) will not directly kill sawfly larvae. Dealing with sawfly larvae involves hand-picking (you can wear gloves if you wish) or dislodging larvae from plants by means of a forceful water spray. 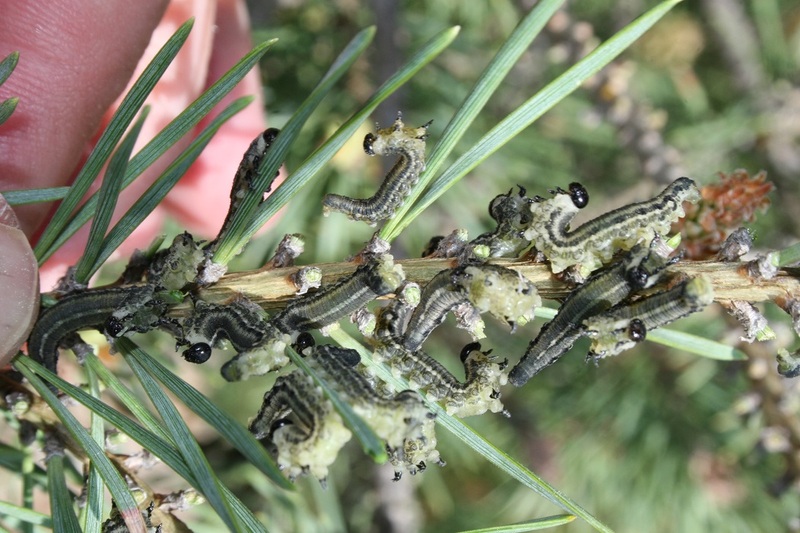 If necessary, there are a number of insecticides that may be applied to suppress European pine sawfly populations including: acephate (Orthene), azadirachtin, carbaryl (Sevin), spinosad (Captain Jack’s DeadBug Brew and Conserve), and any pyrethroid insecticide (e.g., bifenthrin, cyfluthrin, and lambda-cyhalothrin). Be sure to read the insecticide label to make sure that sawflies are listed. For more information regarding European pine sawfly management contact your county or state extension specialist. 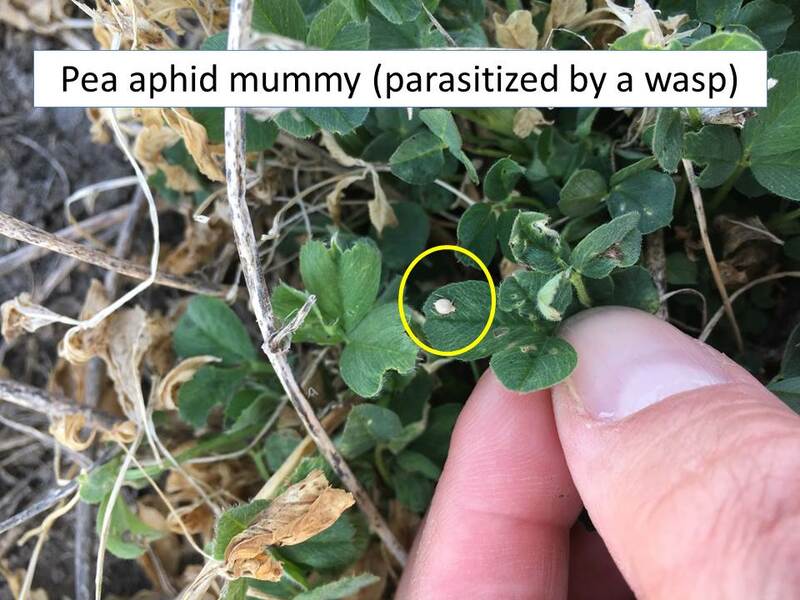 Alfalfa weevil feeding activity has slowed significantly in north central Kansas, at least south of I-70. 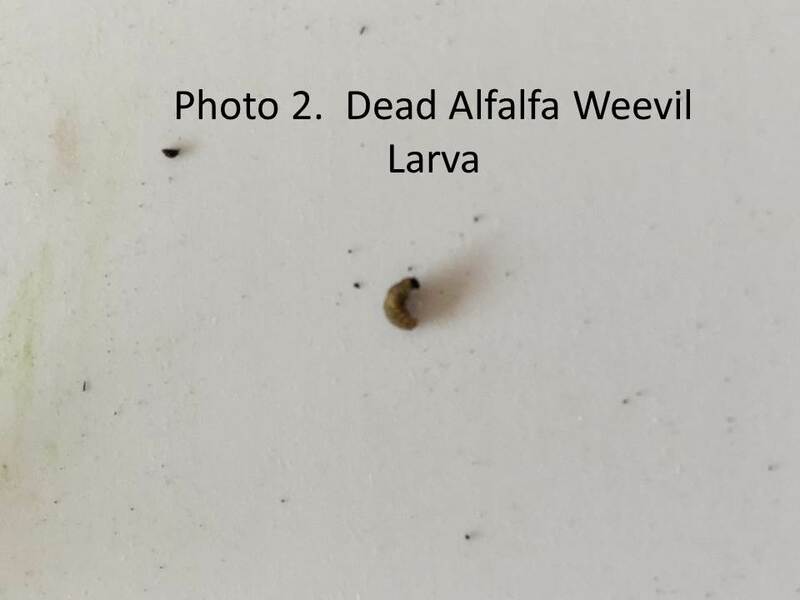 North of I-70, larvae are still developing and thus feeding, but even in the northern counties this feeding and resultant damage should be significantly reduced by the end of the next week. There are still some small larvae but the majority of populations are pupating or have pupated. 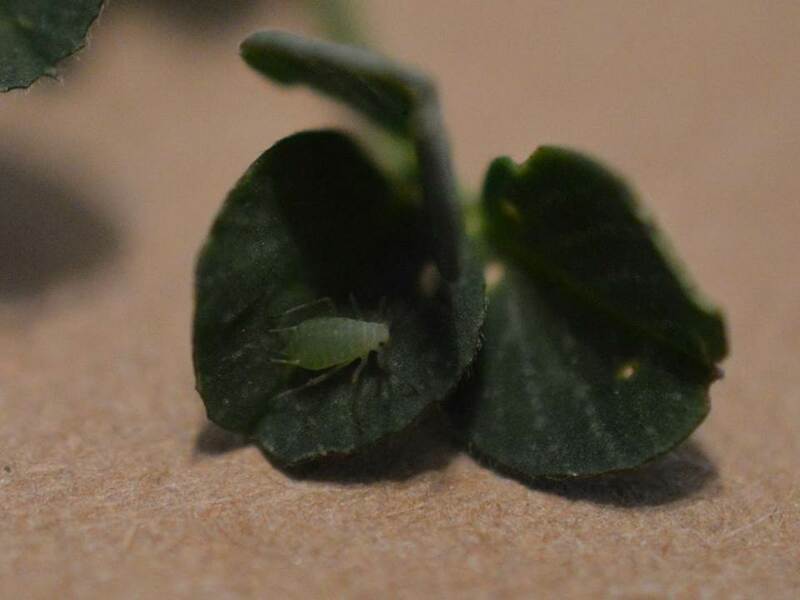 Adult weevils are still hanging out in alfalfa fields and probably will until that 1st cutting, or temperatures get into the mid-80’s or warmer. 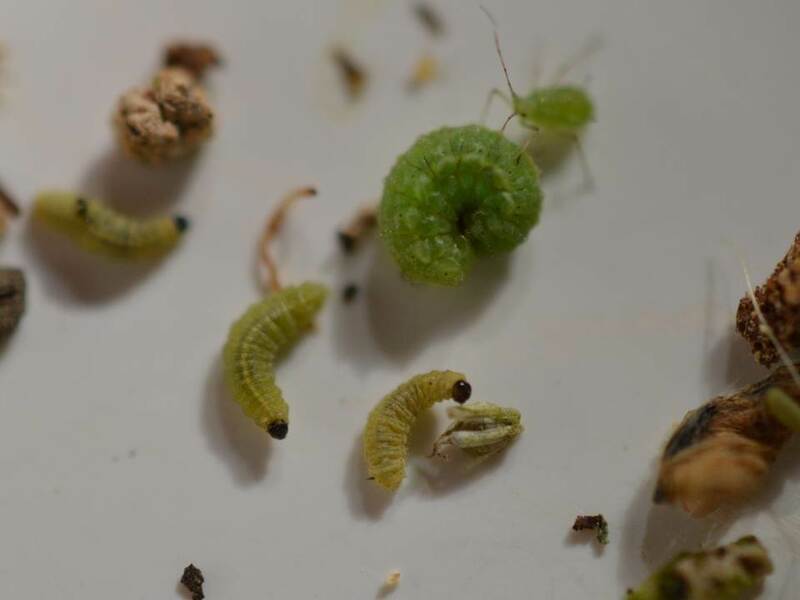 Green cloverworms have moved into the pupal stage, for the most part, and thus have finished feeding on leaves. 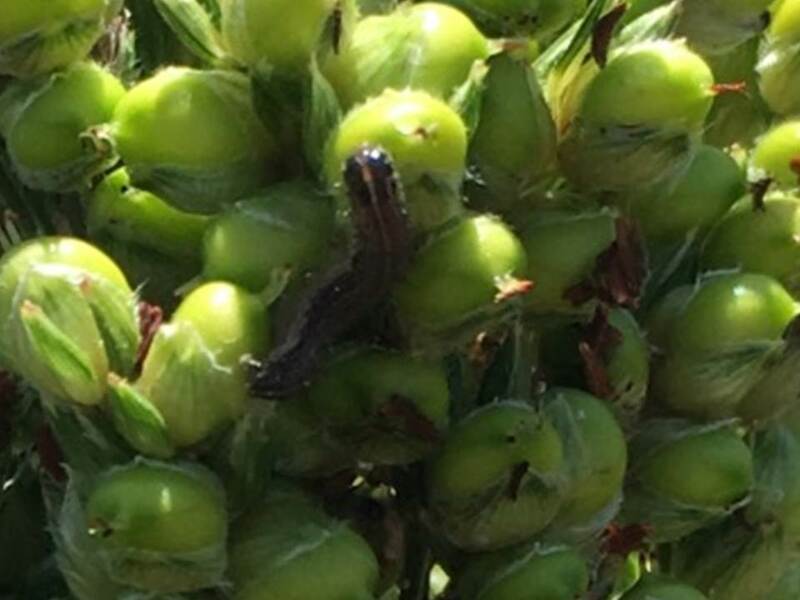 There will probably be another generation of green cloverworms so any late planted soybeans may be at risk for defoliation again although it probably not enough to warrant an insecticide application. 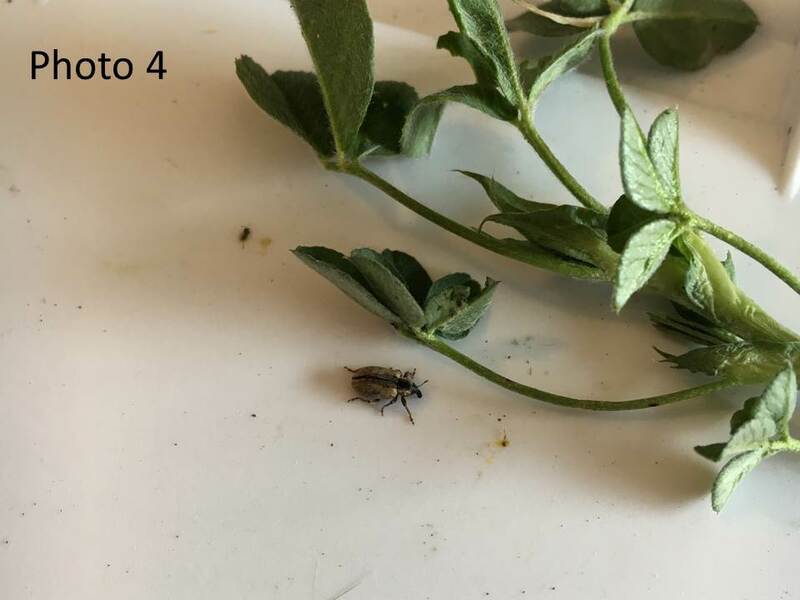 Adult bean leaf beetles and stink bugs may also still be present in soybean fields and feeding on beans as long as they are still filling inside the pods, so monitoring should continue until pods are mature. 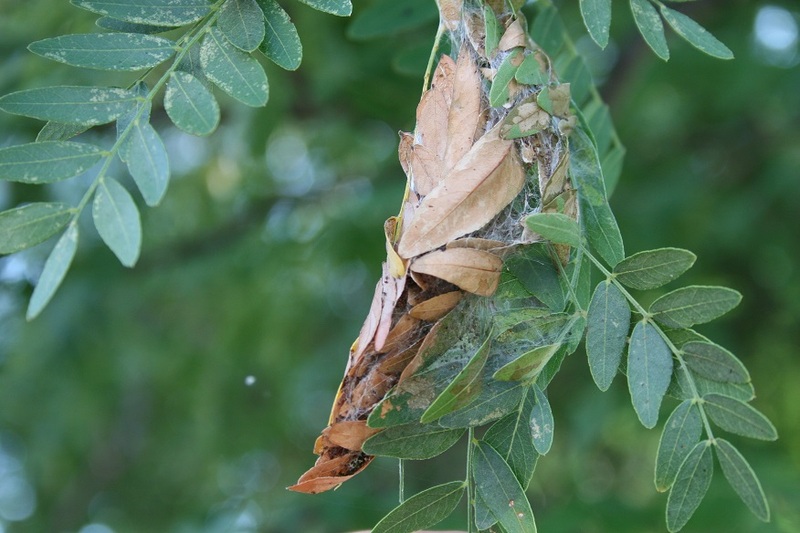 Now is the time of year when mimosa webworm (Homadaula anisocentra) larvae (=caterpillars) are feeding and creating their protective habitat on honeylocust (Gleditsia triacanthos) and mimosa (Albizia julibrissin) trees. The larvae (=caterpillars) are 1/2 inch in length when fully-grown, and rapidly move backward when disturbed (Figure 1). The caterpillar webs leaves together on the ends of branches (Figure 2). Webbing typically starts at the tops of trees and serves to protect caterpillars from natural enemies (parasitoids and predators) and insecticide spray applications. Heavily-infested trees are brown or scorched in appearance (Figure 3) as the caterpillars skeletonize the leaf tissue. Caterpillars eventually fall from trees on a silken strand before pupating. Mimosa webworm pupates in bark crevices or pupae will be glued to structures (e.g. building). 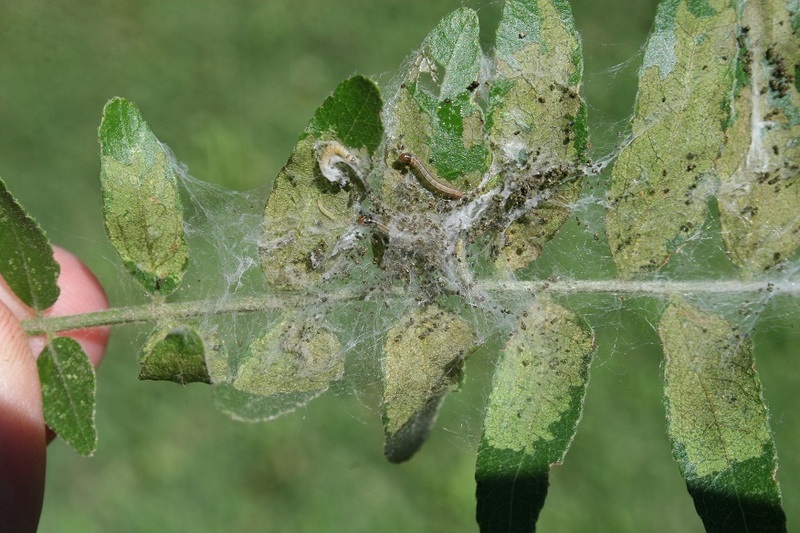 In regards to controlling mimosa webworm infestations, it may be too late although initial damage may be minimal. Insecticides that may be used to suppress mimosa webworm populations, in which the caterpillars are exposed, include: acephate (Orthene), Bacillus thuringiensis subsp. kurstaki (Dipel), spinosad (Conserve), carbaryl (Sevin), and several pyrethroid-based insecticides (e.g. bifenthrin and cyfluthrin). 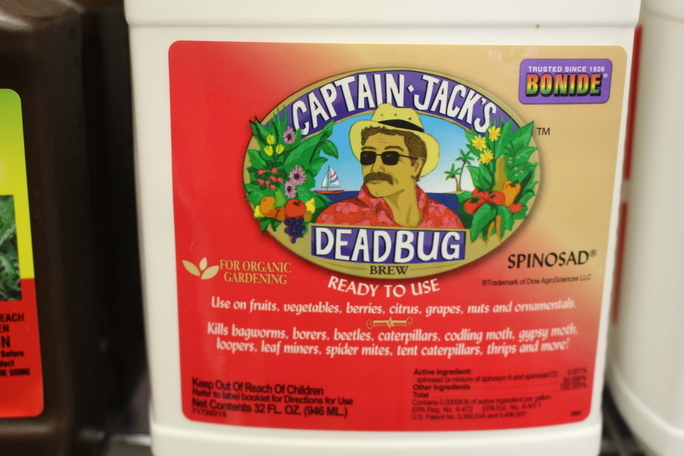 Read the label of each product to ensure that “webworms” are listed on the label. High-volume spray applications are essential in order to contact the caterpillars inside the protective webbing. 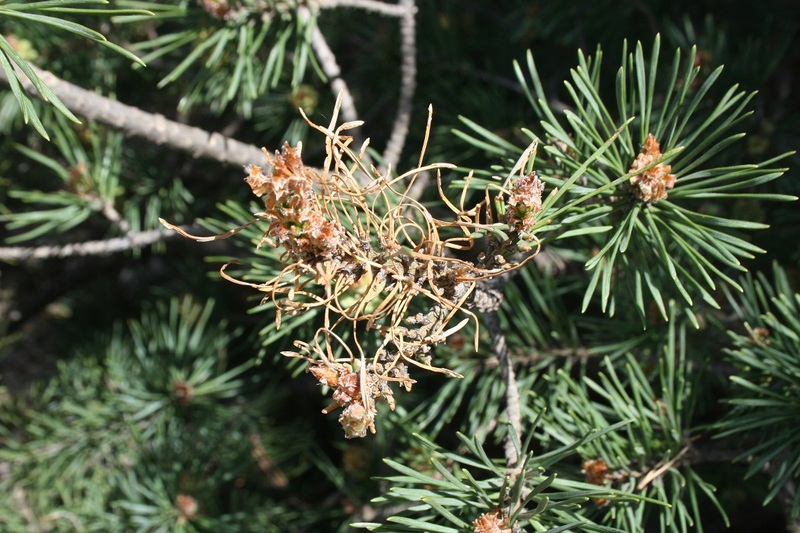 If trees are already heavily-infested with webbing then it may be too late to apply an insecticide. 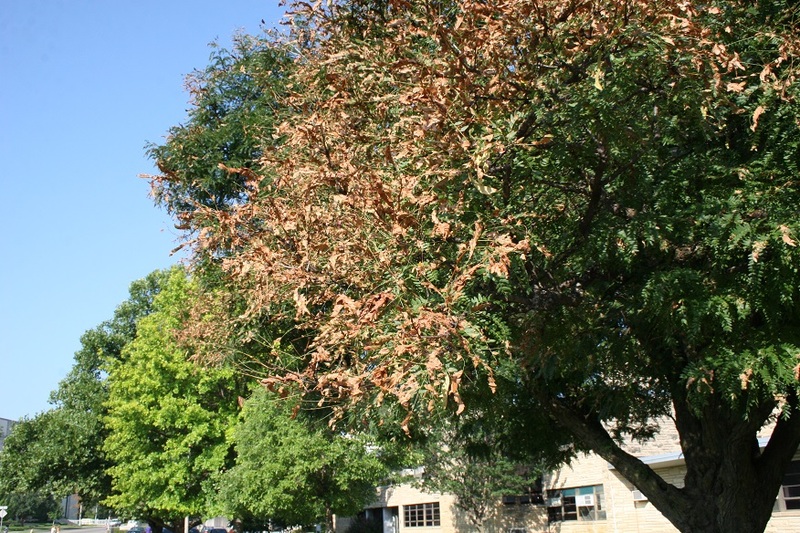 If possible, selective pruning can quickly remove isolated or localized infestations of mimosa webworm. Sorghum is in various stages of development around NC Kansas. The late planted, which seems to be just in the whorl stage- to soft dough, or even farther along. 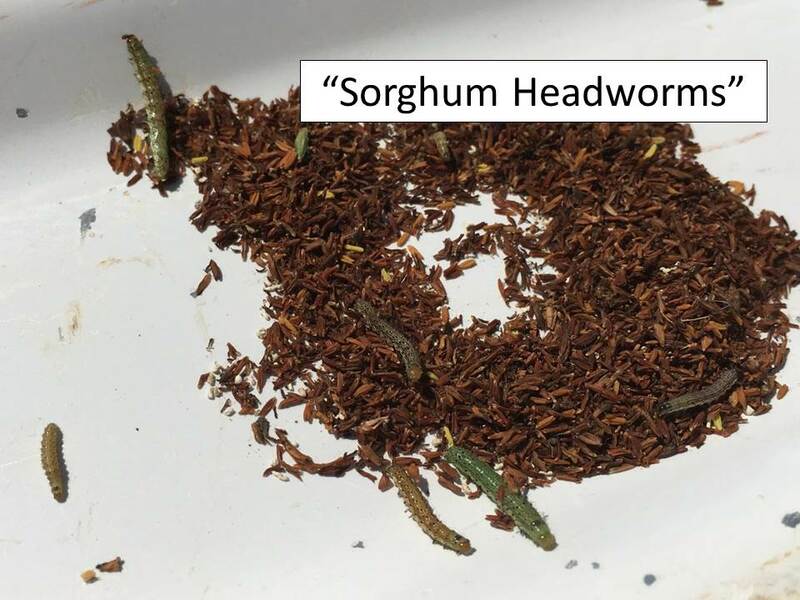 Corn earworms (often called sorghum headworms/soybean podworms etc., depending upon the crop infested) are causing significant infestations and therefore concern because of the highly visible whorl feeding and subsequent “ragged”-looking leaves as they expand from the whorl. This feeding probably will have no effect on yield, and by the time the damage is noticed the worms are mostly finished feeding anyway. Therefore, treatment is rarely justified. Feeding on the kernels however which is the marketable product is a different story. Sampling for head-feeding worms is really relatively easy. Just take a small white bucket, bend the head over into the bucket and vigorously shake it against the sides of the bucket which dislodges the larvae. Then count the worms and divide into the number of heads sampled. 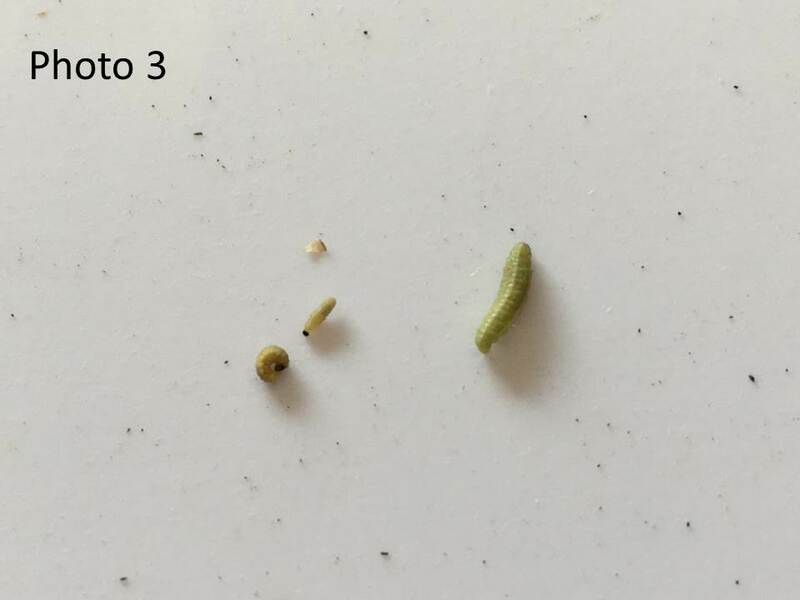 Rule of thumb: kernel-feeding larvae cause 5% loss/worm/head. Sorghum heads are most vulnerable from flowering to soft dough. These larvae are relatively susceptible to insecticides so efficacy is usually pretty good. However, these insecticides will reduce beneficial insect populations which can help later if any aphid populations develop. 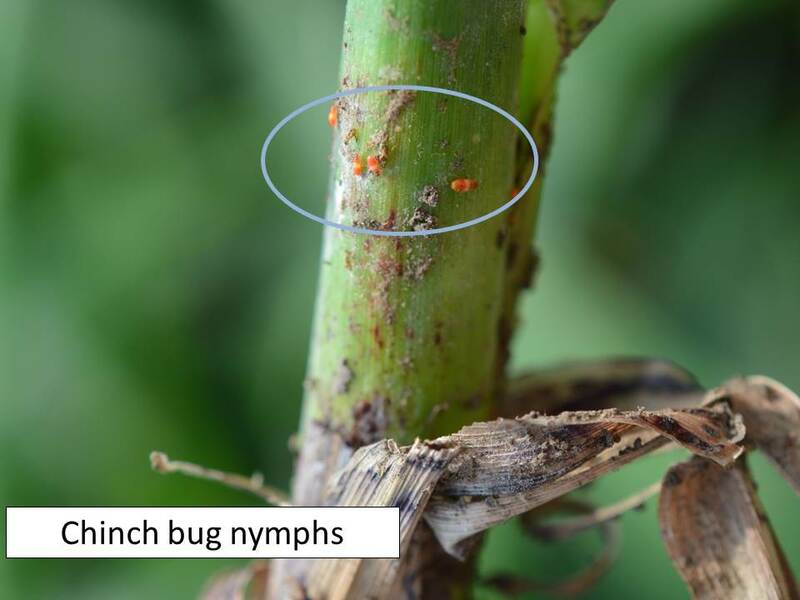 Chinch bugs are really common in sorghum fields throughout north central Kansas. Their feeding will weaken stalks if dry conditions are prevalent. 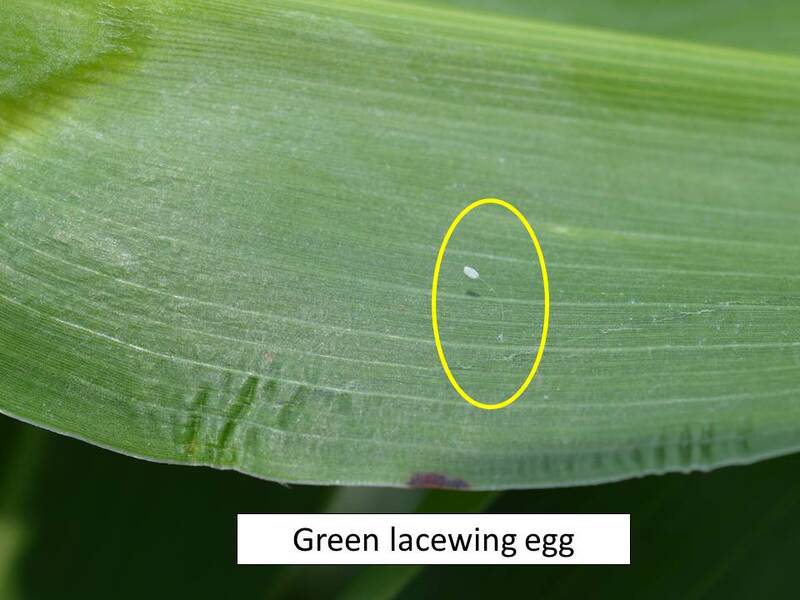 Green lacewing eggs were present, indicating the presence of future beneficials to help with control of potential future aphid populations. Have you noticed that your geraniums and petunias are not blooming (flowering)? Well, the “critter” or culprit causing the problem may be the caterpillar or larval stage of the tobacco budworm (Heliothis virescens). Adults are pale-green to light-brown with the forewing marked with four light wavy bands (Figure 1). The wingspan is approximately 38.0 mm. Adult females can lay between 500 and 1,000 eggs within 2 to 3 days. Caterpillars are 38.0 mm in length when full-grown and vary in color depending on the host plants fed upon. The caterpillars (larvae) may be black, pale brown, yellow, green, and/or red. They may also possess stripes that extend the length of the body (Figure 2). 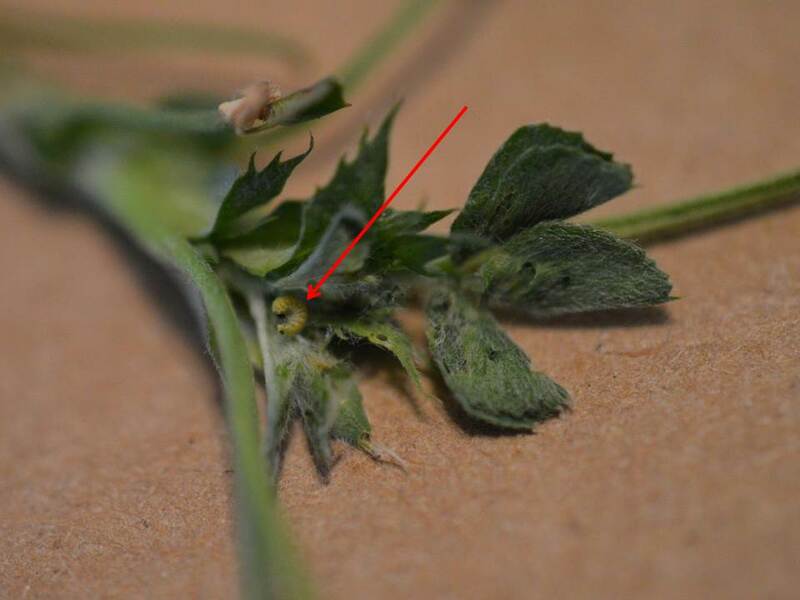 and feed from inside or chew flower petals, which appear ragged (Figure 4). on the flower petals or on leaves below the flowers, which is a clear indication that the caterpillars are feeding. Tobacco budworm caterpillars will feed on a number of annual bedding plants besides geraniums and petunias, including: ageratum, chrysanthemum, nicotiana, snapdragon, and strawflower. 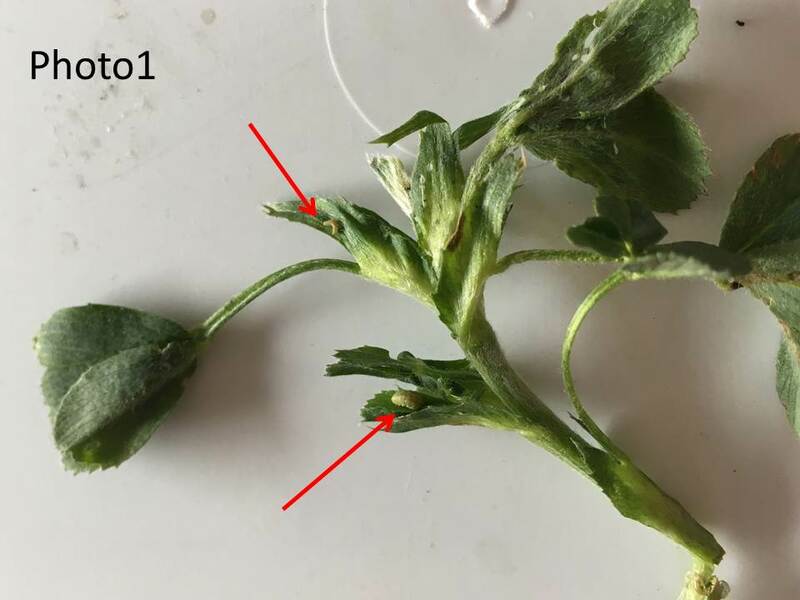 Ivy geraniums may be less susceptible than other geranium types. 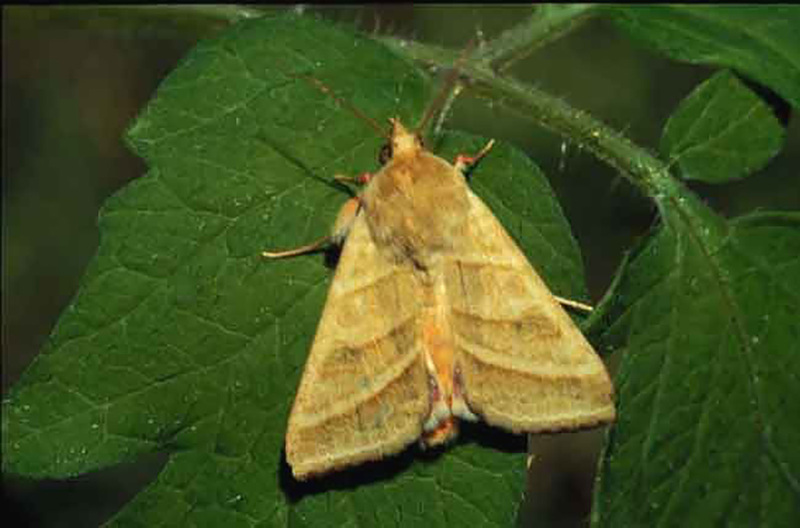 The way to deal with tobacco budworm populations is to apply insecticides before the caterpillars tunnel into the buds using materials containing the following active ingredients: spinosad, cyfluthrin, permethrin, or bifenthrin. Be sure to thoroughly cover all plant parts as tobacco budworm caterpillars will also feed on plant leaves. Davidson, N. A., M. G. Kinsey, L. E. Ehler, and G. W. Frankie. 1992. 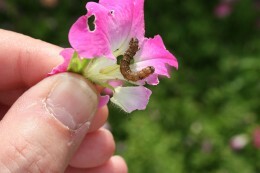 Tobacco budworm, pest of petunias, can be managed with Bt. California Agriculture 46 (July-August): 79.